Another DC comic adaptation coming to the CW in the 2014-2015 season is iZombie, a series that will bring Veronica Mars' Rob Thomas and Diane Ruggiero-Wright back to the network for a crime-solving drama with a zombie twist. Based on characters created by Chris Roberson and Michael Allred, iZombie centers on Liv, a college student-turned-zombie who's getting her fill of brains at the local coroner's office, where she works. 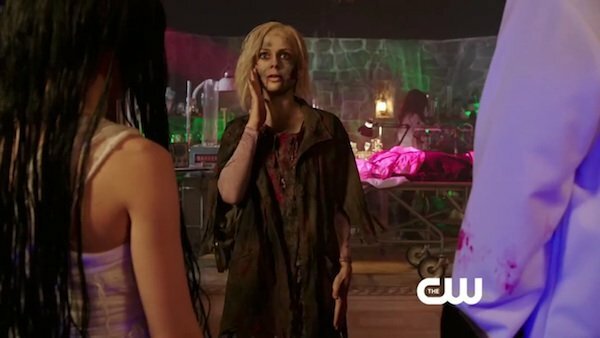 CW isn't releasing a trailer for iZombie yet, but they have given us a couple of glimpses, including the photo above, which shows Rose McIvor's Liv having a snack. Here's the official synopsis for the series. Olivia “Liv” Moore was a rosy-cheeked, disciplined, over-achieving medical resident who had her life path completely mapped out…until the night she attended a party that unexpectedly turned into a zombie feeding frenzy. As one of the newly undead, Liv is doing her best to blend in and look as human as possible. Her appearance now passes for “Goth,” with shockingly pale skin and nearly white hair, and her demeanor has gone from exuberant to exhausted. The change in Liv is baffling to her mother, her former fiancé, Major, and her best friend and roommate, Peyton, who still has the high-energy, Type-A personality that Liv has completely abandoned. Despite her post-traumatic ennui, Liv has devised a way to resist her baser urges to devour fresh human brains – she’s taken a job in the Seattle coroner’s office. In this appropriately dead-end job, Liv can secretly snack on the brains of the many Jane and John Doe corpses that make a final stop in the morgue. Despite carefully covering her tracks, Liv’s boss, Dr. Ravi Chakrabarti, discovers her secret and is surprisingly excited about the scientific possibilities. Even with her boss’ enthusiasm, Liv remains resigned to an eternity without hope or purpose, until she realizes that with every brain she consumes, she retains a portion of that person’s memories. Liv begins to experience visions from the point of view of the murder victims. Much to the surprise of Dr. Ravi and homicide detective Clive Babineaux, Liv often has detailed knowledge of crime scenes and motives that she can’t easily explain. Posing as a psychic, she works with Detective Babineaux to investigate these crimes and discover who is responsible. It’s not the same as being alive again, but at least Liv can find purpose in her undead existence by helping Clive solve the murders of those who are indeed fully dead. The fact that the zombie in this series is beautiful isn't a surprise. This is the CW, where the "Beast" in Beauty and the Beast is good looking. Take into account CW's ensemble of young and beautiful characters and iZombie looks like it'll fit right in, even if its lead character's decaying a bit. Rose McIver isn't just beautiful, she's also adorable. There's no denying that. And the dance-gif above makes me think her cuteness will be utilized in this series, which might add a bit of humor to the tone, as we see this college student trying to turn her zombie lemons into zombie lemonade by solving crimes. We'll have to wait and see how the preview looks once CW gives us a peek at this series. We'll be waiting a while for iZombie to debut, as CW has this one lined up for midseason. View the full 2014-2015 CW schedule here.